A newlywed couple from Philadelphia was banned from flying to Europe on their honeymoon by a U.S. Airways representative who insisted that the bride’s passport was too damaged to fly with. Carly Baker and Chris Fee tied the knot on Friday, and were set to fly out of Philadelphia International Airport to Athens on Sunday. The couple spent two years saving up for their dream honeymoon, and they had planned to travel to Greece, Rome, and other cities on the trip. 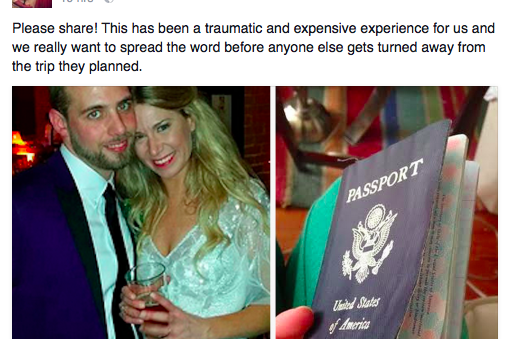 However, the 30-year-old bride soon found out she was banned from boarding her US Airways flight. 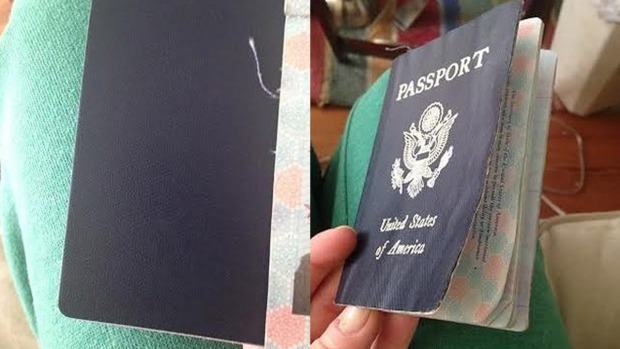 Baker said that the employee thought her passport was too damaged to be used, citing strings hanging off the sides and the seams “splitting”. She and her husband were then directed to a second employee, who snipped the string off and told her it was fine. However, the second employee – who Baker believed was a manager – soon found out that her colleague had made a note in the newlywed’s travel file saying she could not fly on that passport. Baker then applied for a new passport and the couple was forced to rebook and reschedule their hotels and flights – spending almost $2,000 dollars to get back on track. On the other hand, the airline announced that it changed the couple’s international flights with no penalty, but is standing by the decision to turn down Baker’s initial passport. The newlyweds arrived in Crete on Wednesday, and are finally ready to begin their well-deserved honeymoon.